Methyl 2-Methoxy-5-Sulfamoylbenzoate CAS 33045-52-2 is an important product in our company. It widely used to synthesis sulpiride that belong to benzamide class antipsychotic drug application in treatment of psychosis associated with major depressive disorder and schizophrenia. Methyl 2-Methoxy-5-Sulfamoylbenzoate CAS NO 33045-52-2 is high purity white powder with the molecular formula of C9H11NO5S and formula weight 245.25. 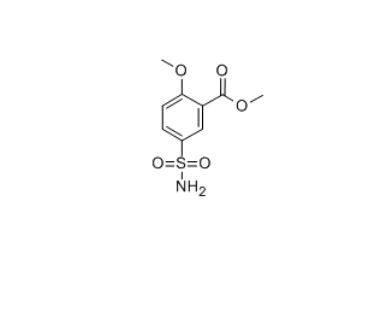 We can offer the sulpiride Intermediate 33045-52-2 in a proper packaging, and transport to appointed destination. .
Sulpiride is a dopamine D2 receptor antagonist. It has been used therapeutically as an antidepressant, antipsychotic, and as a digestive aid. Looking for ideal 33045-52-2 Manufacturer & supplier ? We have a wide selection at great prices to help you get creative. All the CAS 33045-52-2 are quality guaranteed. We are China Origin Factory of CAS NO 33045-52-2. If you have any question, please feel free to contact us.